Can a Do-It-Yourself Intervention Be Successful? A person who is concerned about a loved one’s drug abuse may feel that the time has come for a “tough love” intervention. From the vantage point of individuals experiencing substance abuse, any intervention may seem like tough love. From the vantage point of those affected by the addiction, a tough love intervention may be their best option to help break the cycle of addiction. At present, there is little research data available on the effectiveness of an intervention, but it is generally a recommended course of action among addiction specialists. In some cases, an informal talk is simply not enough to get a person to get help. A formal intervention, on the other hand, is a clear signal to the substance abuser that it is time to make a change. What Is Involved in a Tough Love Intervention? 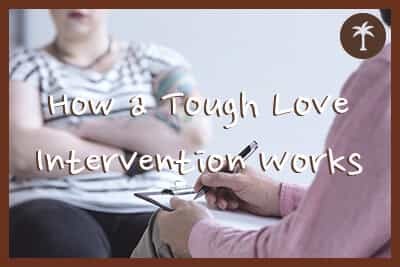 As the name suggests, a tough love intervention involves a calculated but firm approach to getting the loved one into rehab. An ultimatum statement, included in an intervention letter, is a main component of a tough love intervention. It is important to work on any internal resistance one has to writing and then expressing an ultimatum. One can also keep in mind that an intervention group does not necessarily have to get the point of invoking their ultimatums. Less than 10 percent of most interventions get to the point where the members need to state their ultimatum. Similarly, Jeff Jay, an interventionist and the author of Love First: A Family’s Guide to Intervention, has found that only about 5 percent of his interventions involve someone who is so resistant to rehab that the intervention gets to the point where the group states their ultimatums. In the face of the intervention group’s pleas alone, a person who is experiencing substance abuse may decide to go to rehab. It is helpful to put the ultimatum statement in context. In an intervention, whether led by a professional interventionist or not, there are a few key steps that should be covered. At least one concerned person should take the lead and be the contact point. Other concerned individuals who can make a significant contribution should commit to the process and come together to form the intervention group. The intervention group will need to devise a rehab plan. The main goal of an intervention is to get the friend or family member immediately into treatment. Preparations must therefore be made in advance. One or two members of the intervention group should be selected to physically take the loved one the rehab immediately, if the offer is accepted. If a professional interventionist has been hired, they may be the one to take the person to rehab. Each member of the group should write an intervention letter. The letter should include one’s loving feelings, examples of the effects the drug abuse has had, concerns, and the offer of rehab. In a tough love intervention, an ultimatum is included in the letter. The ultimatum statement must be well-crafted and have stakes for the person who is abusing drugs. Generally, the ultimatum should entail a significant loss for the loved one. For instance, if a parent is providing the person with housing, and this person has no convenient access to other housing, a suitable ultimatum could be: If you do not accept our rehab offer today, then you can no longer live in my home. This means that if you do not go to rehab today, you must immediately go home and remove all your belongings and turn in your house keys to me. The intervention group should hold a rehearsal before the actual intervention. It is critical that their loved one does not find out about the rehearsal or scheduled intervention. The rehearsal provides each member with a way to work out some of the most pressing emotions, which may include guilt and anxiety. In addition, each member can read their intervention letter and get feedback so that all letters conform in tone and intention. If the loved one accepts the offer of rehab, the plan must be implemented immediately. It is critical not to lose any momentum. If the loved one rejects the rehab offer, it is essential that each ultimatum (in each intervention letter) go into immediate effect. Tough love is love. An intervention only exists because concerned loved ones want to help. When holding a tough love intervention, it is critical to keep these points in mind and remain committed to the end goal. No one really wants to enable drug addiction, but contributing in any way to a person’s lifestyle of drug abuse only enables it. There need not be any self-blame for enabling the drug abuse. In fact, a person affected by another’s substance abuse may be experiencing codependency, which some therapists believe is itself a disease. As bestselling author and codependency expert Melody Beattie explains, codependency occurs when a person gets detrimentally wrapped up in caring for a substance abuser. A codependent person’s emotional wellbeing and day-to-day functioning are impacted by the loved one’s substance abuse. As Beattie notes in her book Codependent No More: How to Stop Controlling Others and Start Caring for Yourself, codependent people tend to be among the most kind. However, their kindness can have the undesirable side effect of perpetuating the loved one’s addiction. Getting tough in the face of addiction is truly one of the kindest responses to have.Importantly, individuals who are affected by addiction must learn to make their own needs a priority. Staging a tough love intervention is also a way of being kind to oneself. Being tough in order to be kind may seem counterintuitive, but it makes good sense in the face of addiction.